I've been working through the first book in a new devotional series, Devotions from the Torah. 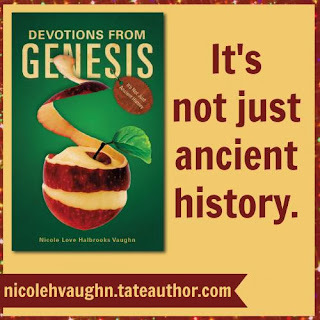 Devotions from Genesis by Nicole Love Halbrooks Vaughn has been fascinating. I also have her second book, Devotions from Exodus Part One, but I haven't done much more than look at it. 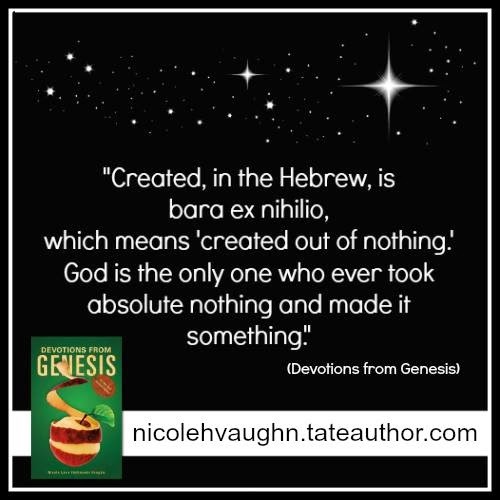 See for yourself how Genesis, the book of beginnings, is not just ancient history and that the Word of God is still alive and timeless. 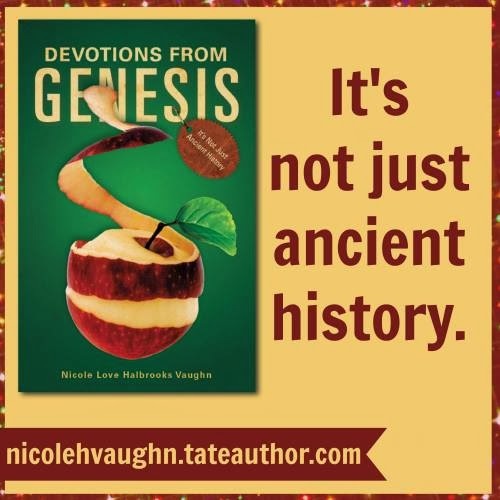 Nicole Vaughn's Devotions from Genesis will take you on a journey from the Garden of Eden to the courts of Pharaoh in Egypt, allowing you to see your own hurts, struggles, and joys through the lives of patriarchs from Adam to Joseph. You will gain insight into your heart and more importantly, insight into the very heart of God. One day at a time, you will be reminded that you are not alone. About the books: these books are set up with the idea that you read a chapter from the Bible, and then do the next devotional portion. Each section starts off with a scripture quote, then a few paragraphs from the author, and finally a prayer. My thoughts: I've really enjoyed what Nicole has to say. The very first one talked about the Hebrew meanings of many of the verbs - moving, said, saw, separated. This appealed to my inner etymologist. It goes on for a couple more sentences, and maybe it just felt oh-so-real because I had had one of those total failure days. But something about the prayers makes me feel like Nicole is speaking truth about herself, and truth about me too. 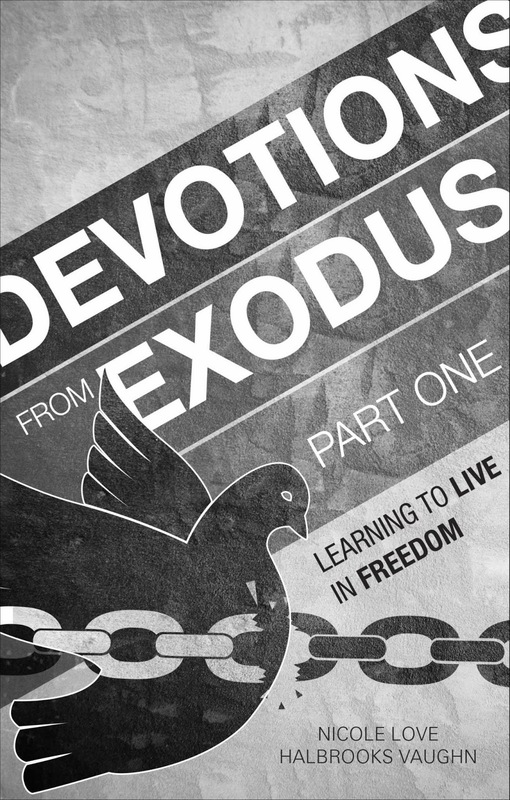 I get to give away both Devotions from Genesis and Devotions from Exodus Part One! This is the pdf version, and it these are really nice books! These would be great for anyone from older teens on up. I haven't been. I have been just using my bible without a devotional but I keep thinking I'd like to add one in. Sometimes....sometimes I just stick to straight scripture reading. It depends on the time of year. I usually do The Bible in 90 Days starting on January 1st, so no devotionals for the first 3 months of the year. Sometimes yes, sometimes no~ Sometimes my main devo is reading Bible with my 6 yo... ;) I am currently getting devotional readings/thoughts of the day from a friend who is doing "Unglued" with a group of online ladies. I do. Currently going through Experiencing God. I am in between devotionals right now. Most of the time I just read through Scripture with my bible dictionaries. Sometimes, I should more often. We trade off from devotional to scripture memorization. It is at this time of year when we want to remain on track for our curriculum and have so much to catch up on that both become shorter on a daily basis. I love devotionals! I have reviewed several amazing ones on my blog this year and am trying to decide which one I'd like to focus on this year!